With an order of 1,300 Mercedes-Benz Sprinter 310 CDI vans, Deutsche Post DHL is moving their fleet into the next generation of cutting-edge Sprinter van technology. With each unit including standard features like the Electronic Stability Program and adaptive brake lights. 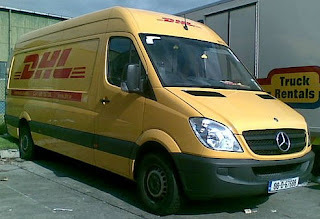 With a company as large as Germany's DHL using Mercedes-Benz Sprinter vehicles for their efficiency, ergonomics, and environmental standards, a Mercedes-Sprinter Van can move your company to the next level. Mercedes-Benz of Lynnwood is a full service Mercedes-Benz Sprinter dealer. From sales to service and parts, "Sprinterman" Tom Brookshire can help meet your Sprinter needs here in the Seattle area.